30/10/2018 - The company Giusti produces a high-quality balsamic vinegar and relies on the "golden rules" that Giuseppe Giusti has set up to produce a vinegar which can convince the vinegar lovers and connoisseurs around the world. The company Giusti produces a high-quality balsamic vinegar and relies on the "golden rules" that Giuseppe Giusti has set up to produce a vinegar which can convince the vinegar lovers and connoisseurs around the world. The Giusti brand is well known and their mission is to bring this typical vinegar of Modena on the tables of families, for which a simple vinegar is simply not enough. 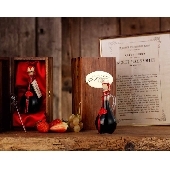 Giusti has won many awards over the years for its high quality balsamic vinegar. You can enjoy this vinegar with salads, vegetables, Parmesan cheese and omelette. You can also prepare excellent sauces for steaks and boiled meat with this vinegar. Surprise your guests with an ice cream or strawberry dessert topped with balsamic vinegar. 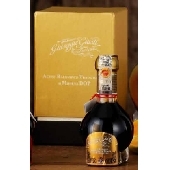 Balsamic vinegar 3 Medaglie d�Oro �Riccardo Giusti� Champagnotta da 250 ml. 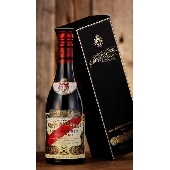 "Aceto Balsamico Tradizionale Extravecchio di Modena DOP(""Real"" traditional balsamic vinegar - 25 years and older) - ml 100"
Balsamic Vinegar 5 Medaglie d'Oro Banda Rossa Champagnotta with case 250 ml.